Shenzhen, China the 11th january 2012. 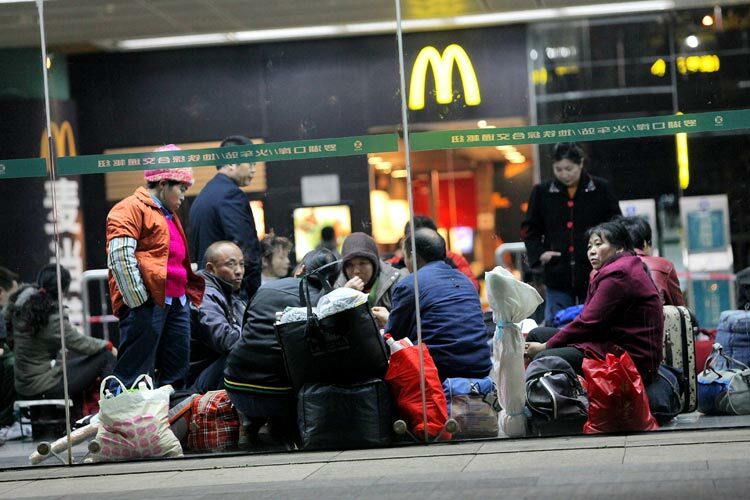 "Mingong" migrant workers going back home wait for the train home for Spring festival in Shenzhen railway station. Shenzhen, China the 11th january 2012. 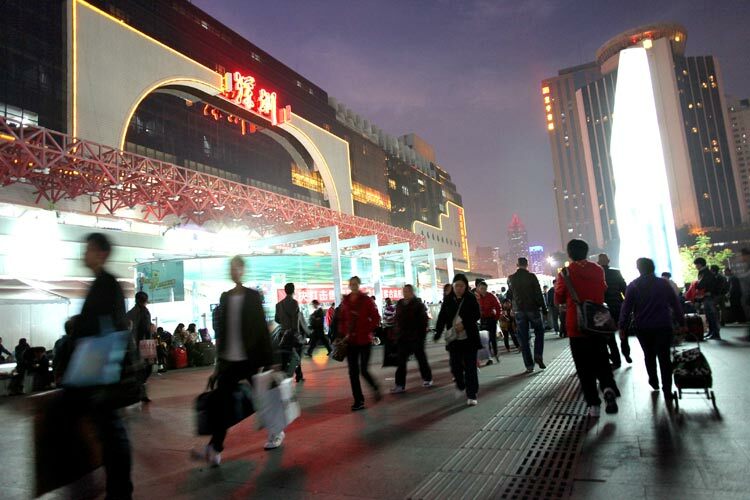 People go take the train to join family for Spring festival in Shenzhen railway station. Shenzhen, China the 11th january 2012. 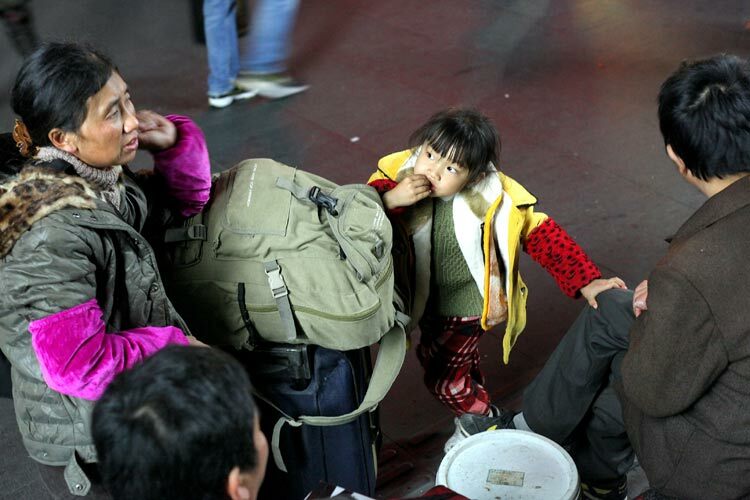 Children of "Mingong" migrant workers going back home wait for the train home for Spring festival in Shenzhen railway station. 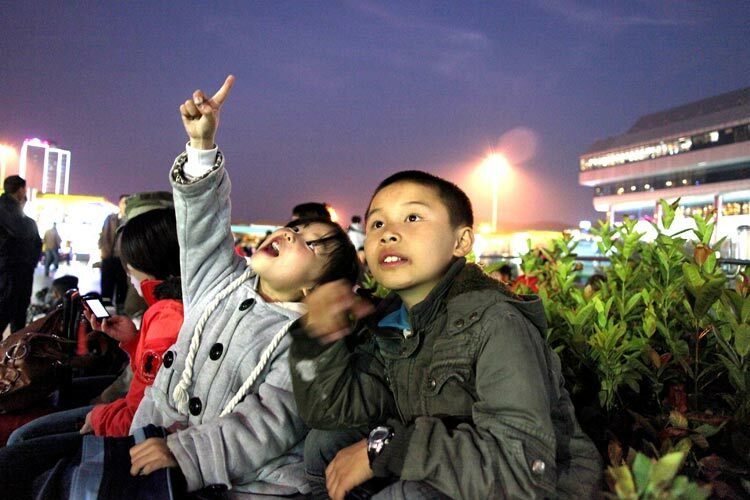 they watch a plane flying in the sky. Shenzhen, China the 11th january 2012. 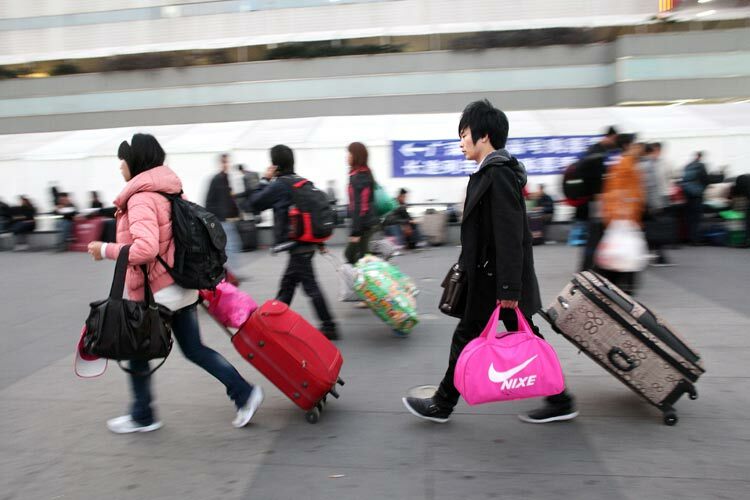 A man holding a copy of a Nike bag goes take the train to join family for Spring festival in Shenzhen railway station. Shenzhen, China the 12th january 2012. 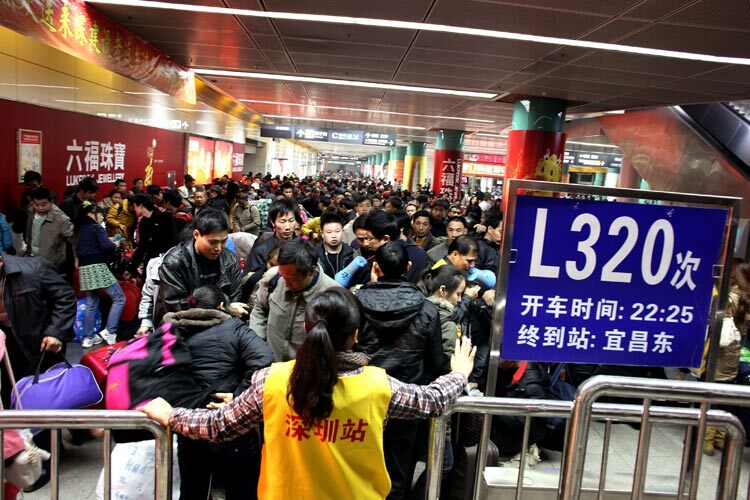 Chinese people go take the train to join family for Spring festival in Shenzhen railway station. Shenzhen, China the 11th january 2012. 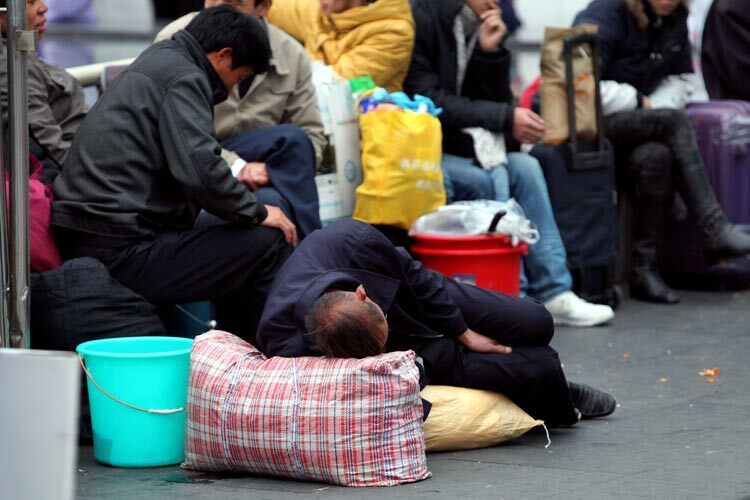 "Mingong" migrant worker sleeps on his bags waiting for the train home for Spring festival in Shenzhen railway station. 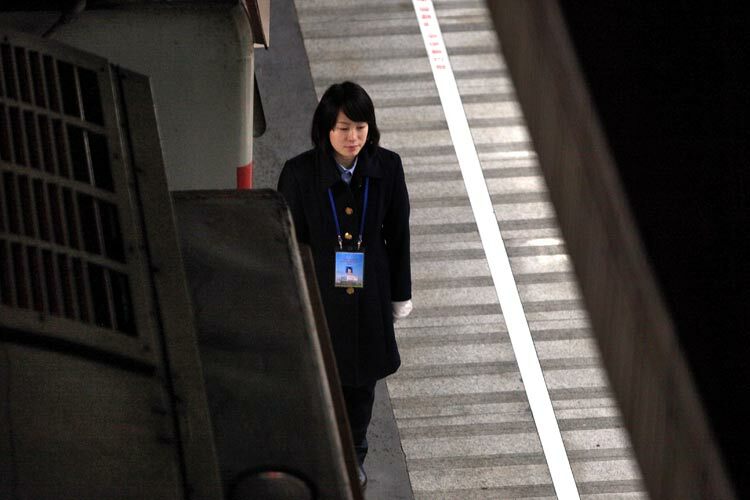 Shenzhen, China the 11th january 2012.Security officers from the Shenzhen railway station help a woman navigate the new organization because of the heavy traffic. Shenzhen, China the 11th january 2012. 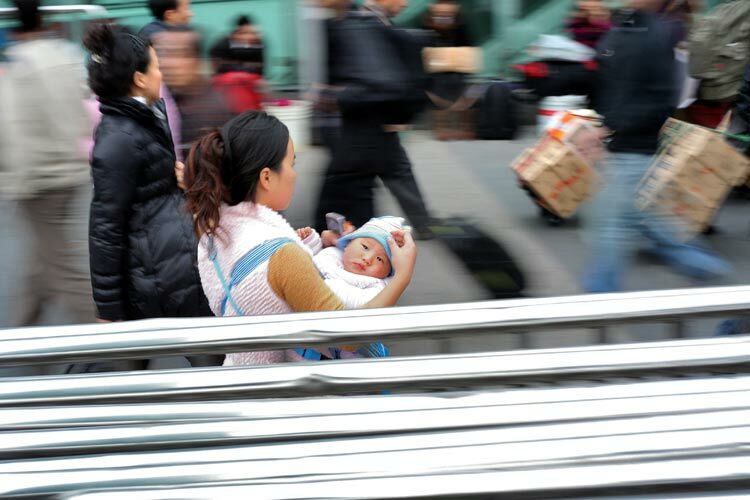 A woman and her baby go take the train to join family for Spring festival in Shenzhen railway station. Shenzhen, China the 12th january 2012. 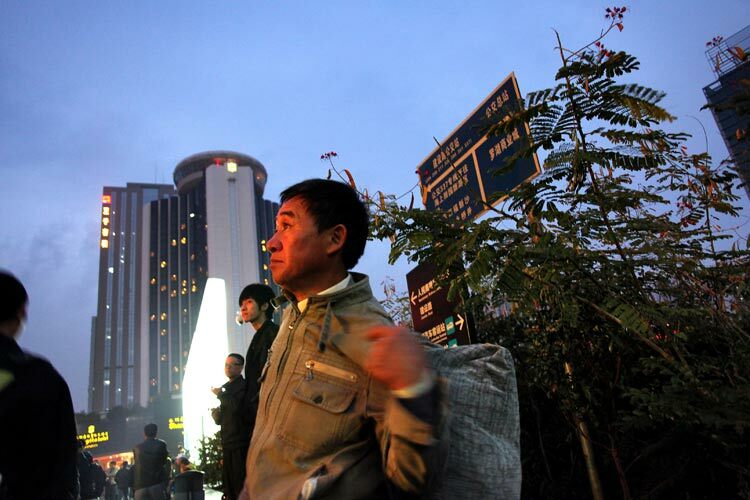 "Mingong" migrant worker going back home looks at the information board outside the station waiting for the train home for Spring festival. Shenzhen, China the 12th january 2012. 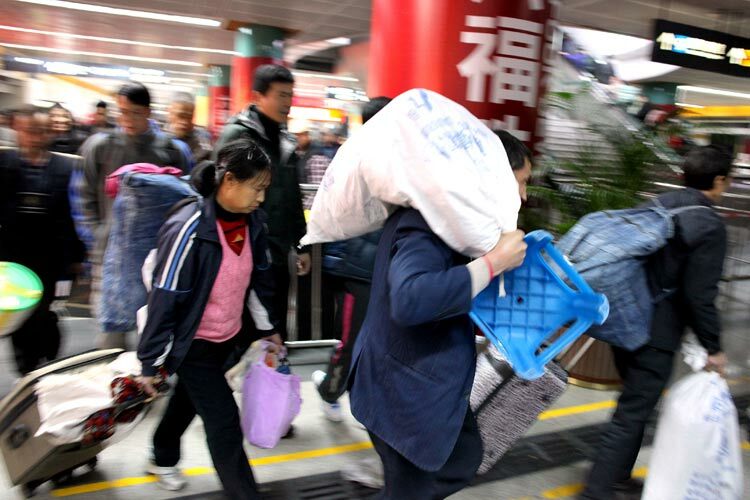 "Mingong" migrant workers going back home go take the train home for Spring festival in Shenzhen railway station. Shenzhen, China the 12th january 2012. 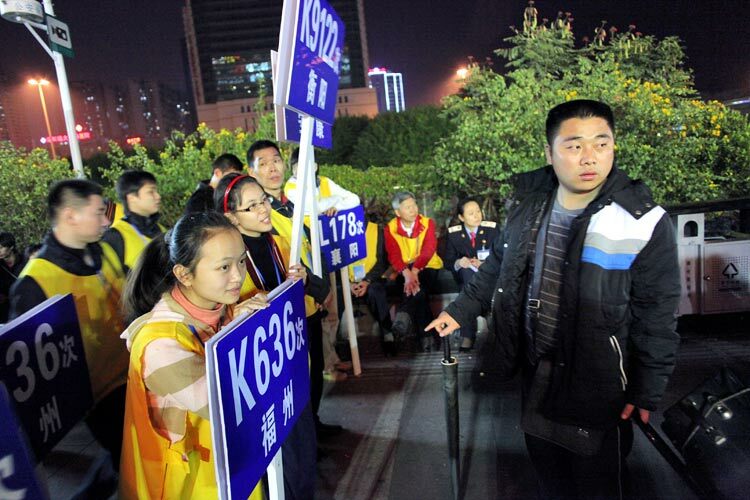 Employee of the Shenzhen railway station holding a sign with a train number written on it to organize the many departures related to Chinese New Year. Shenzhen, China the 11th january 2012. 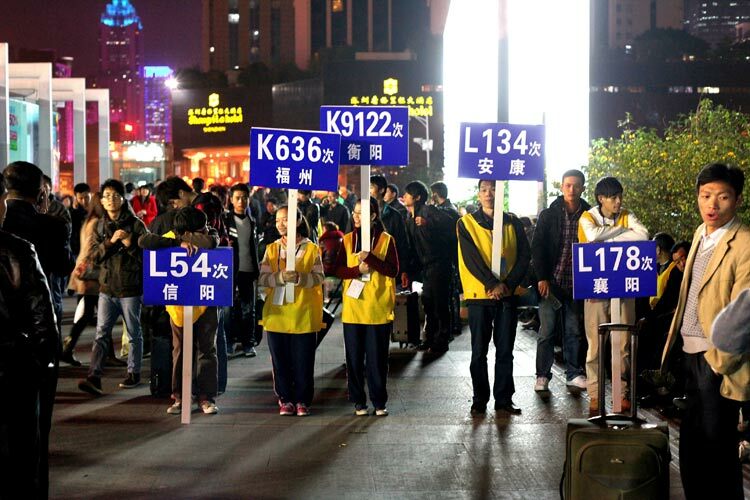 Employees of the Shenzhen railway station holding a sign with a train number written on it to organize the many departures related to Chinese New Year. Shenzhen, China the 12th january 2012. 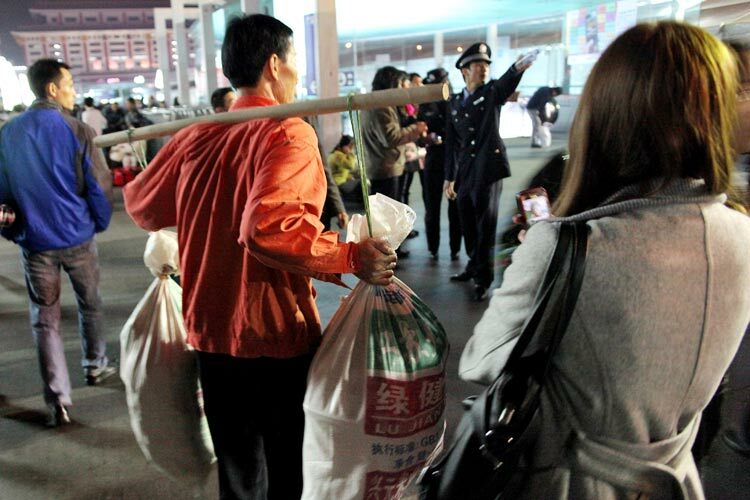 Passengers who take the L134 train follow the Shenzhen railway station employee holding a sign with the train number written on it to organize the many departures related to Chinese New Year. 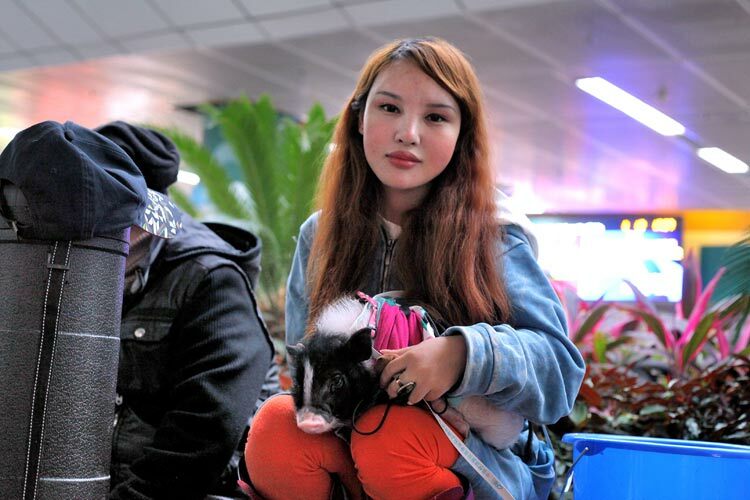 Shenzhen, China the 12th january 2012.Chinese girl with her little pig waits for the train to join family for Spring festival in Shenzhen railway station. Shenzhen, China the 12th january 2012. 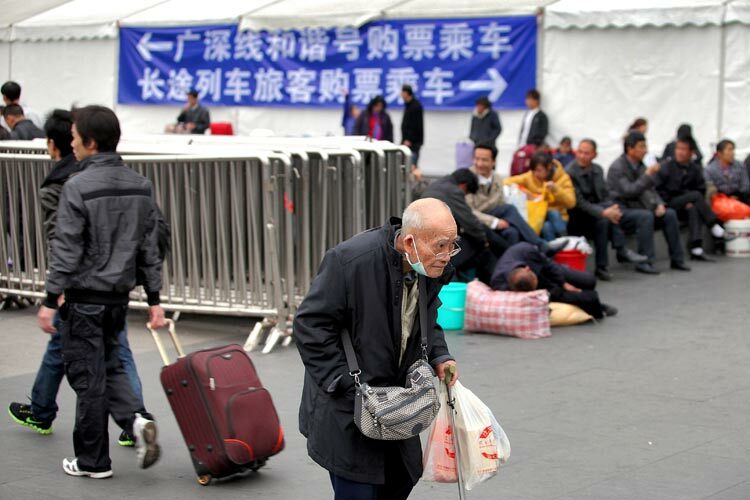 Chinese passengers wait for the L320 number train in a special area to join family for Spring festival in Shenzhen railway station. Shenzhen, China the 12th january 2012. 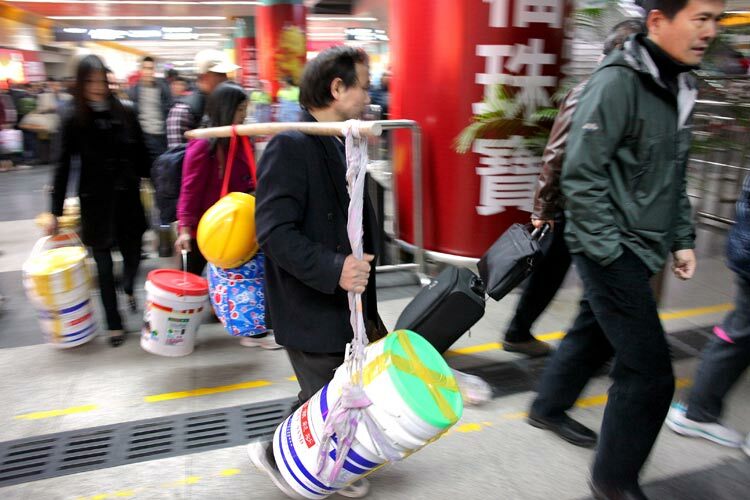 "Mingong" migrant worker going back home wait for the train home for Spring festival in Shenzhen railway station hall. 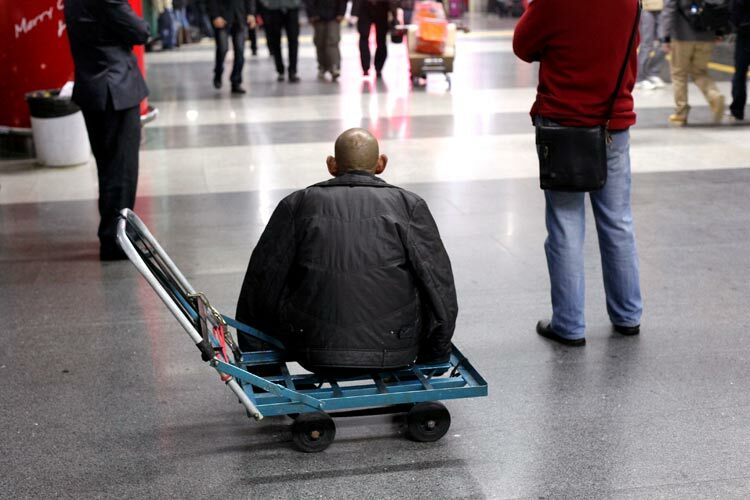 He sits on the carriage bearing his luggage and watching television to pass the time. Shenzhen, China the 12th january 2012. 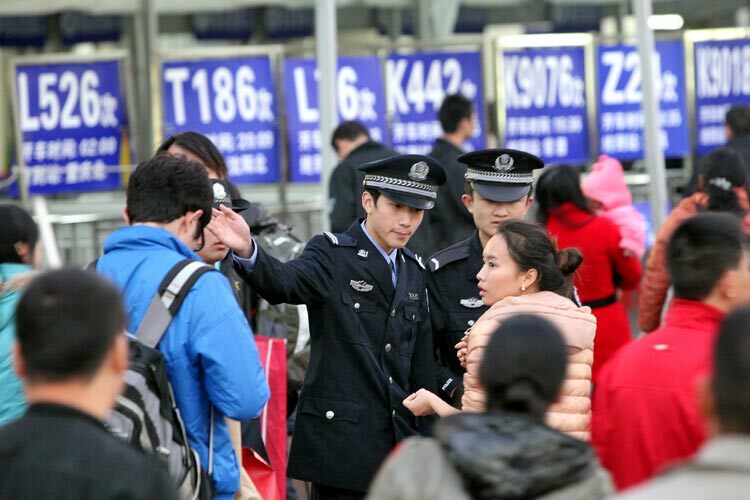 A train ticket inspector is waiting in Shenzhen railway station passengers will take the train to join their families for Spring festival. Shenzhen, China the 23th january 2012. 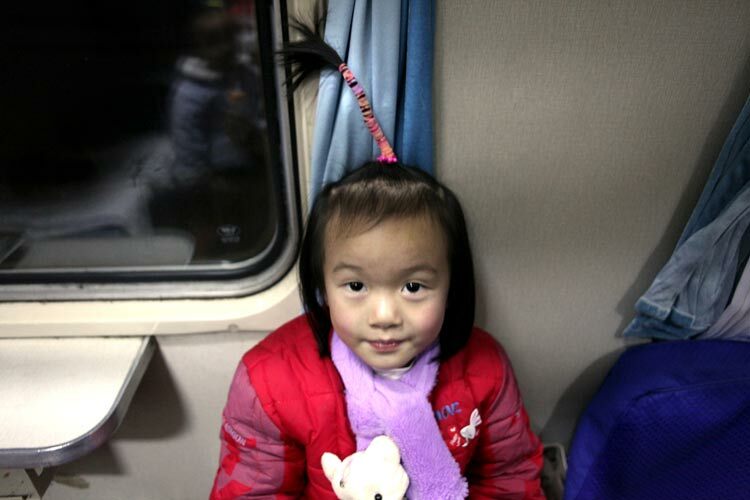 A little girl sits in the corridor of the train leaving Shenzhen to go back home for spring festival. Shenzhen, China the 11th january 2012. 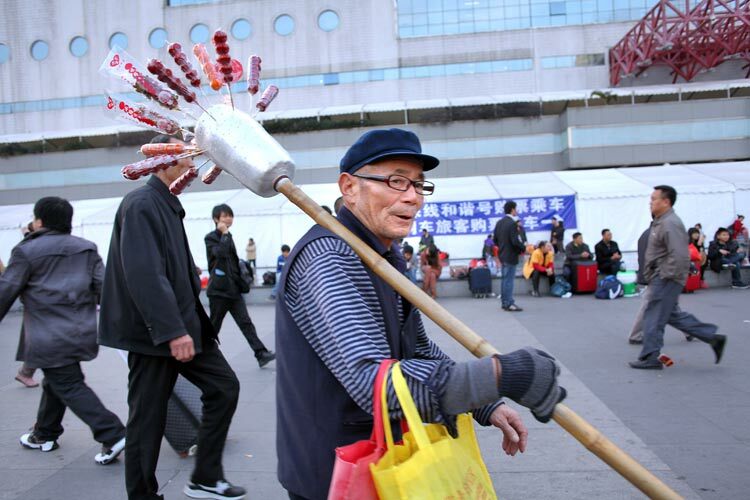 An old man takes advantage of the traffic selling lollipops at the Shenzhen railway station. Shenzhen, China the 11th january 2012. 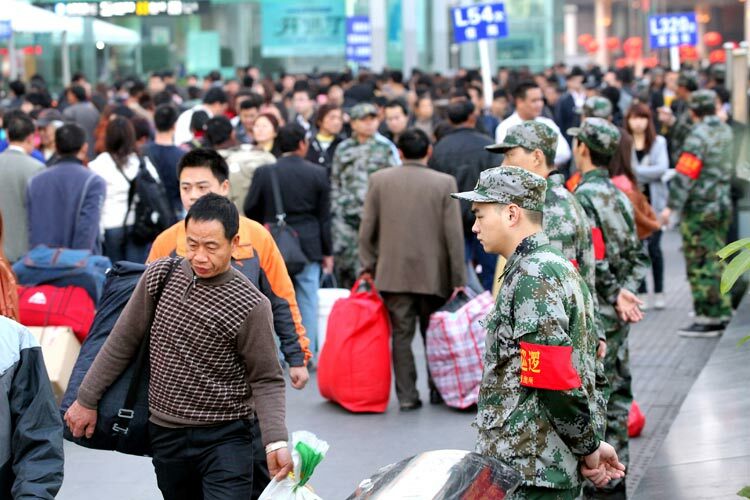 Mingong" migrant workers going back home go take the train home for Spring festival in Shenzhen railway station. 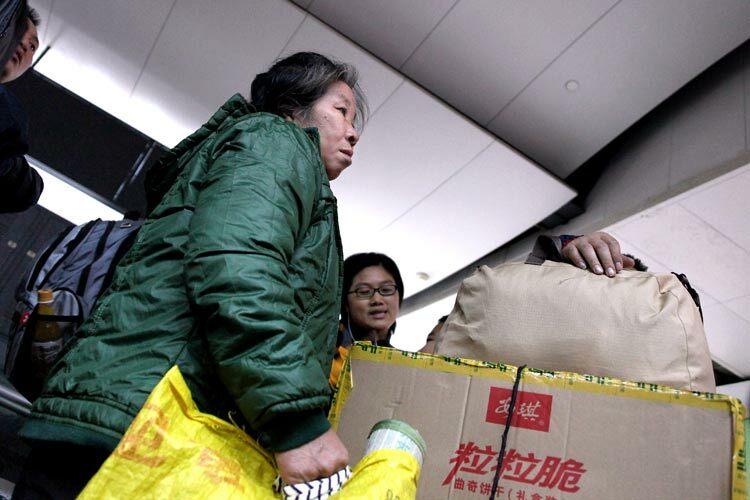 Shenzhen, China the 11th january 2012.A "Mingong" migrant workers family going back home wait for the train home for Spring festival in Shenzhen railway station. Shenzhen, China the 23th january 2012. A woman and her son going back home eat noodle soupe waiting for the train home for Spring festival in Shenzhen railway station. Guilin, China the 28th january 2012. A little girl rests on a bench waiting for the bus in a waiting room. Shenzhen, China the 12th january 2012. 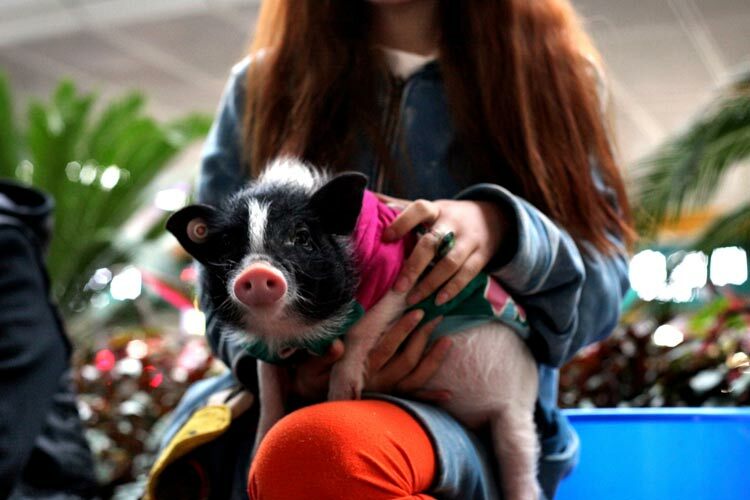 Chinese girl with her little pig waits for the train to join family for Spring festival in Shenzhen railway station. Shenzhen, China the 23th january 2012. 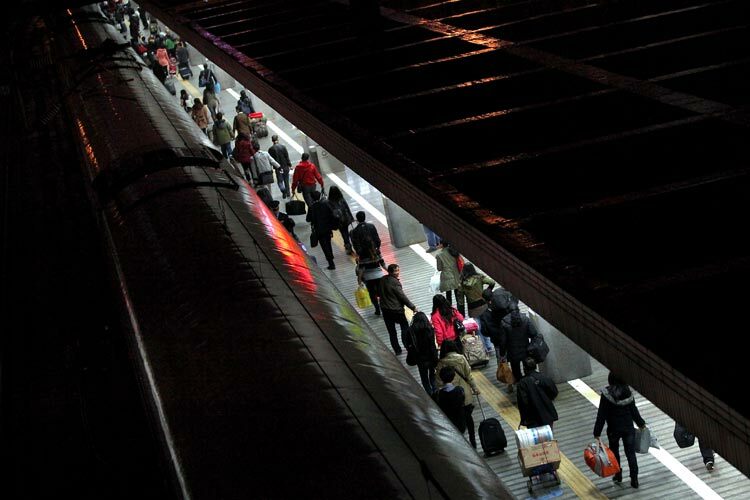 "Mingong" migrant workers going back home wait for the train home for Spring festival in Shenzhen railway station. Shenzhen, China the 11th january 2012. 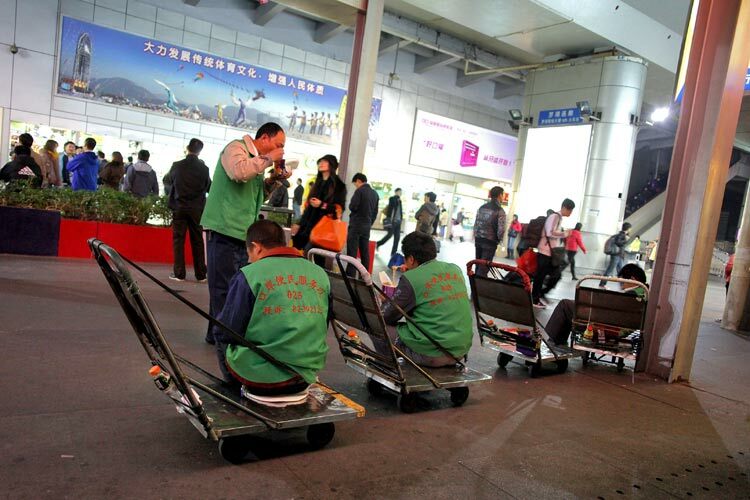 Luggage carriers eat a noodle soup while waiting for customers in Shenzhen railway station. 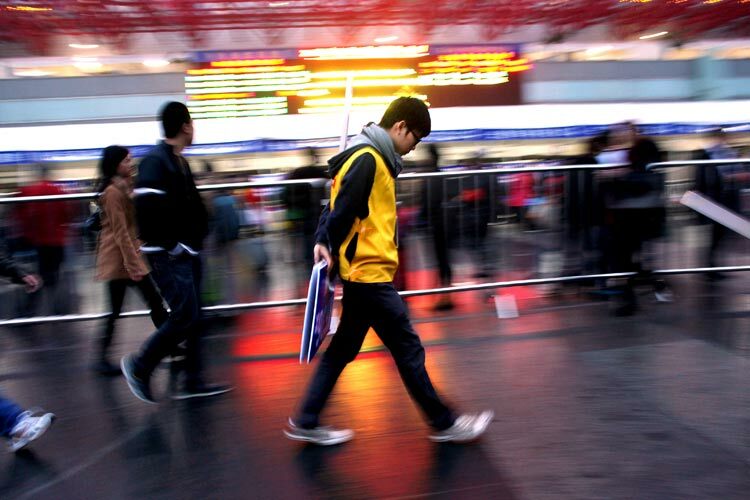 Shenzhen, China the 11th january 2012.A senior goes take the train to join family for Spring festival in Shenzhen railway station. Shenzhen, China the 11th january 2012. 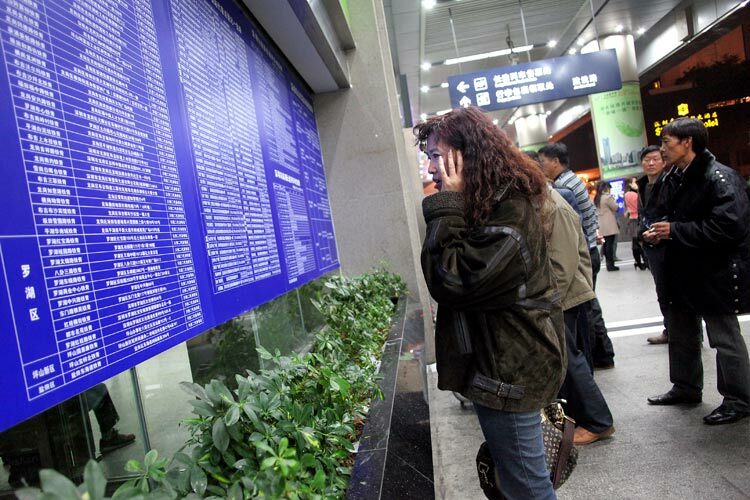 A woman looks at the information board outside the station waiting for the train home for Spring festival. Shenzhen, China the 11th january 2012. 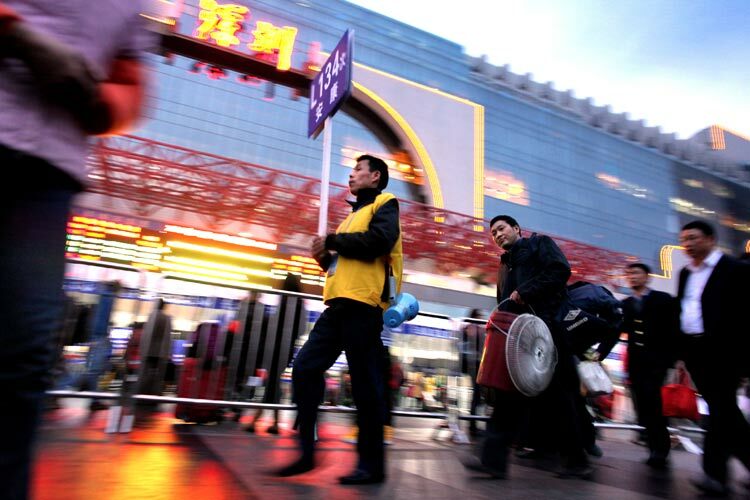 "Mingong" migrant workers walking along Security officers line from the Shenzhen railway station go take the train home for Spring festival. Shenzhen, China the 11th january 2012. 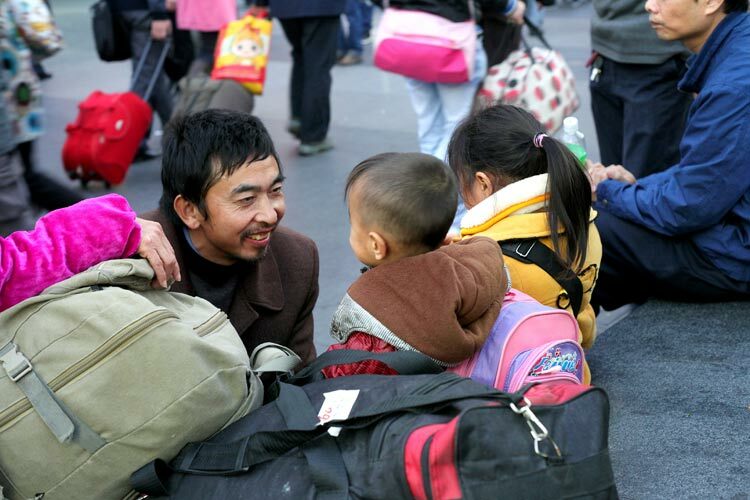 A "Mingong" migrant workers family going back home wait for the train home for Spring festival in Shenzhen railway station. Shenzhen, China the 11th january 2012. 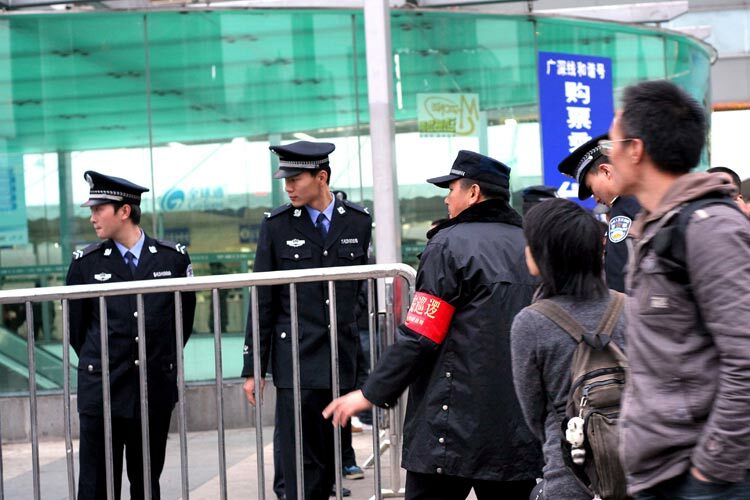 Security officers from the Shenzhen railway station put security gates to control the heavy traffic because of chinese new year.